It took me about 30 minutes to make them all! 3. 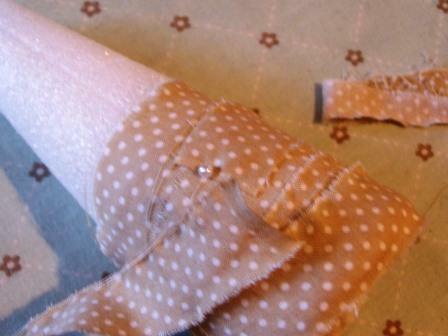 At the base of a cone use a floral pin to secure a strip of fabric. Begin wrapping that strip of fabric all around the cone, overlapping edges slightly. 4. When you reach the end of a strip, grab another strip and secure the first strip to the second strip with a fabric pin – just stick in the Styrofoam, being sure to secure the end and beginning of the strips. 5. Continue to wrap until you are finished (I used about 2 strips per cone for wrapping..if you use a larger cons, you will need more strips.) when you reach the top wrap around the top to cover the Styrofoam (you will be placing a toothpick in here so, try to keep a little space open in the center to poke this in). Secure the strip to the top with a pin. 6. You can be done if you want..or I used one more strip – secure to the top with a floral pin (you can secure it using the pin you just inserted to finish off the wrapping). Twist this strip of fabric and then wrap around the tree, like a garland – you are not wrapping to cover just to accent. Finish off the end with a floral pin. 7. Decorate the tree with floral pins – by using the pearl headed pins to secure the fabric, you are also decorating, so just keep doing it. 8. Place a skewer in the bottom center of the cone. You can then place the trees in anything you want. I kept my skewers long and used my milkglass vases to display them. You can grab some floral foam and tuck them into many different types of containers. 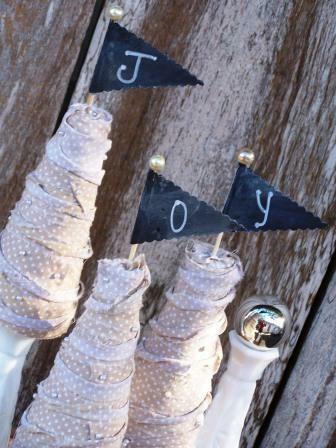 Add some FUN with Sweet Little Pennants of JOY!! I made some pennant ornaments using Canvas Corp paper the other day and these tree topper pennants were inspired by those. but these are easily adaptable to any wording and so EASY to finish. Place small drops of Gorilla Glue Super Glue on the tip of the skewer and then place pearl/bead on the point (insert the point into the pole). Cut 3 pennant triangles on the fold in chalkstock (I used my decorative edge scissors to cut the edges). My triangles are 2″ wide at the top/fold and 3″ long. Place glue allover the inside of the pennant, place skewer in the fold; press both sides of chalkstock together. Cut (or I just broke them) the skewers to the desired size, at least a few inches long. When dry, insert into the top of the cone…I mean tree! What are you lovin' this holiday season? So shabby chic, Holly! They are so cute! And I love how easy to make they are. Definitely what I need right now! Love the trees and they are so cute sitting on the milk glass vases! Cute trees! I love the fabric. Thank you for sharing. Happy Holidays! Tickled Pink No. 77...and 2 Weeks of Features! A Little CA Grown Magic...ROSES!